It’s time for some new flooring in your home. Ideally, a new floor should last you for years, decades, or even generations. But that’s no reason why you can’t look to what’s popular right now, to get some ideas. 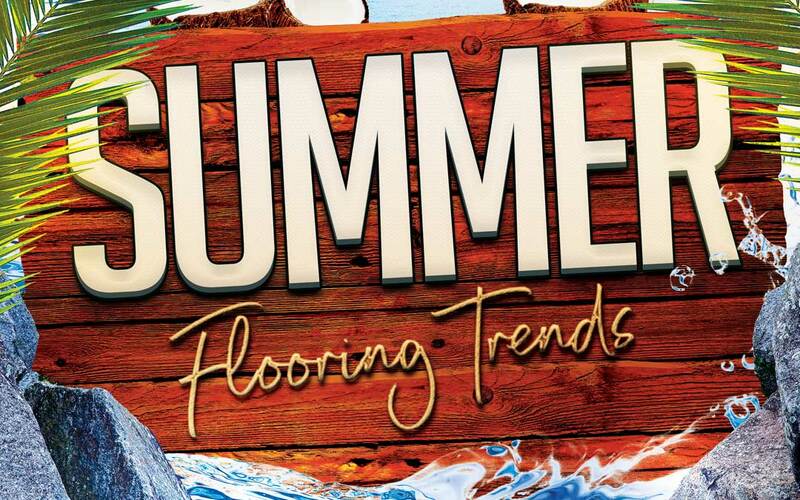 Here are a few summer flooring trends to think about as you make your decisions. When it comes to aesthetics, whites and greys are both very popular. They’re subtle colors, which makes them versatile, and they go well with just about any décor. White in particular brightens up the room, and can make it appear larger as well. Grey, meanwhile, is a cool, neutral color that blends well with other colors. With a lighter color as your base, you can throw in a number of accents to draw attention and liven things up, such as a brightly colored rug, or furniture. Of course, this doesn’t mean you need to stick with solid white or solid grey for your flooring. A lot of floors blends streaks of both, along with subtle browns and even a touch of black, for a textured look that can be achieved with vinyl, tile, wood, a variety of other flooring material options. Of course, if you prefer a natural, hardwood look, lighter colors are still the way to go, according to current flooring trends. Blonde and pecan are among the most popular wood colors right now, as they give your floor a very natural look that exudes comfort. And while it may be the current style, it will also look good as part of your décor for years to come. This may be a relatively recent trend, but it’s one that will hopefully never go out of style: installing flooring that’s environmentally friendly and has less of a carbon footprint. One of the best options in this regard is bamboo. Unlike a lot of wood options, it’s sustainable (i.e. it can be harvested without destroying the entire plant, which grows back quickly). Bamboo is also naturally antibacterial and easy to clean and care for. And it comes in a variety of colors and styles, to look just like a regular hardwood floor. Another great flooring material that’s increasing in popularity is cork. Similar to bamboo, it’s sustainable and grows back quickly (about every three years or so). And not only is it antimicrobial and non-allergenic, it also repels insects naturally. This can reduce your need for bug sprays and insect repellants that can be harmful to the environment. Plus, it’s aesthetically versatile and can last you for decades. Or, if you want something a little less traditional, you might try flooring made from recycled rubber. It’s been popular in gyms and similar public places for years, but lately it’s been on the rise in private homes, particularly in kitchens and bathrooms. It’s soft underfoot, as well as durable and long-lasting. It’s also water-resistant and stain-resistant, which makes it easy to take care of. And it comes in a wide variety of colors and styles, to match the rest of your décor. These are just a few of the flooring trends that have been popular this summer. If you’re looking to redo your own floors, talk to a flooring expert about your options and try to find the style and material that best suits you. There are a lot of options out there. With a little knowledge and a little guidance, you’ll be able to find the flooring that’s not only trendy right now, but will also make your home look and feel great for many years to come.